Polynomial is an expression built on variables (also called indeterminates) and coefficients. It involves operations of addition, subtraction, multiplication and only non-negative integer exponents of variables. 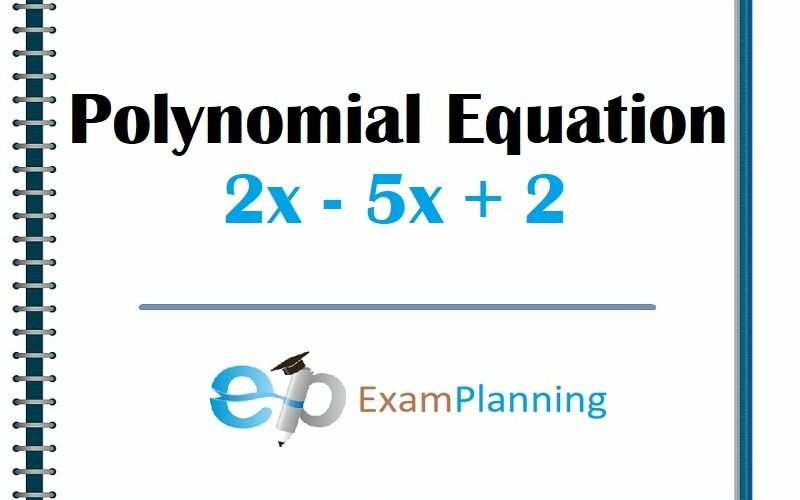 A simple example of polynomial is 2x – 5x + 2. This equation has only single indeterminate ‘x’. These expressions can be transformed from one to the other by way of applying usual properties like commutative property, associative property and distributive property of addition and multiplication. Polynomials appear in a various areas of mathematics. For example, they are used to form polynomial equations, which encode a wide range of problems, from simple to complicated problems in mathematics; they are used to define polynomial functions, used in calculus and numerical analysis to approximate the other functions. In advance form these are also used to construct polynomial rings and algebraic varieties, central concepts in algebra and algebraic geometry. exponents (like 2 in x2), but only 0, 1, 2, 3, … etc are allowed and no negative number is allowed. These terms can be combined by way of addition, subtraction, multiplication and division but never division by variable. Polynomials can have as many as terms as required by these cannot be infinite.